The formal entry of a Roman emperor into a city was known as an adventus. Constantius’ adventus on 28 April, 357 was no mere stroll through the gates. On the contrary, it was a solemn and spectacular occasion, vividly described by the soldier and historian, Ammianus Marcellinus. But why bother to record such an event? 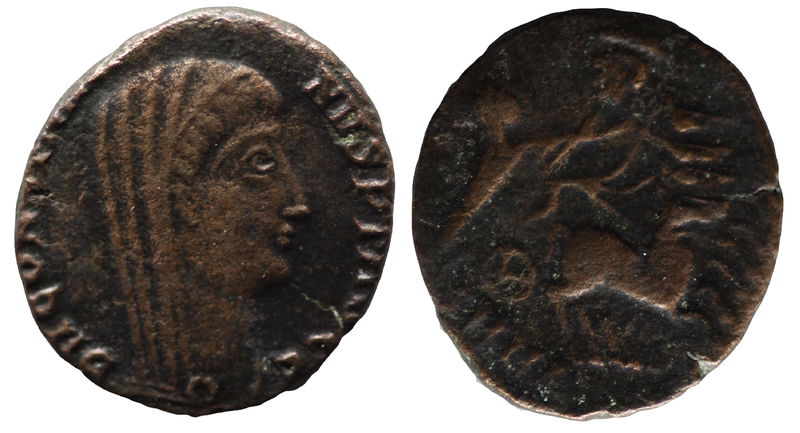 AE15 showing deified Constantine. Issued under Constantine II Junior and Constantius II. Obverse shows Constantine the Great, veiled. DV CONSTANTINVS PT AVGG. Reverse has Constantine riding in a chariot up to heaven, stretching out towards the manus Dei. 15mm, 1.42g, 3 o’clock. For the first two and a half centuries of the imperial period, Rome was the unquestioned centre of the Roman Empire, just as it had been in the republican period. But in the third century, a string of military crises required the emperors to spend long periods far to the north or east of Rome. It became increasingly clear that governing from Rome was strategically problematic. In the late third century, the emperor Diocletian instituted the Tetrarchy, a system whereby four men ruled the Empire as a group. In apparent recognition of the changing strategic needs of the empire, none based themselves in Rome, but rather in cities closer to the imperial borders and potential trouble spots. Constantine the Great (father of Constantius II) went further, founding the city of Constantinople and using it as his permanent place of residence. The changed situation laid bare a further and long unacknowledged truth: that power was centred on the emperor and the imperial court, not in any particular city. Rome’s long-held position as the capital of the Empire was thus largely based on the assumptions and sympathies of earlier emperors. Indeed, from the third century onwards most emperors were not natives of Rome, or even of Italy, and probably felt no automatic affinity with the city. This too contributed to the diminution in Rome’s status. But though by Constantius II’s day Rome had long since ceased to be the political, administrative, and strategic heart of the Roman Empire, it undoubtedly remained its symbolic centre, the revered mother city from which the empire had grown. For this reason, a visit to the city by an emperor was a significant event. It was designed to convey to his subjects the emperor’s power and lofty status. According to Ammianus, Constantius’ visit to Rome was also intended as a way to mark his recent defeat of the usurper Magnentius, and so perhaps to emphasize that he remained in full control of the Empire. Ammianus paints a picture of Constantius’ formal procession into Rome. Soldiers with polished shields and helmets marched ahead of the emperor, as did the heavy cavalrymen (clibanarii) in their expertly-crafted full-body armour. Constantius himself appeared upon a golden chariot, decked out in robes encrusted with precious gems. Surrounding him were men carrying spears with golden and bejewelled tips to which dragons of purple thread had been attached, fluttering in the breeze. Ammianus mockingly tells us that the emperor was the very image of imperial composure and dignity: he remained utterly still, even when the route taken was bumpy, and stared fixedly forward at all times. And yet, as the historian scornfully remarks, the emperor, though a diminutive man, would stoop when he chariot went under a high archway. The emperor subsequently toured the city, and was constantly dazzled by the many sights. He addressed both the senate and people of Rome, and gave public games. In a letter to some later emperors, the Roman noble and man-of-letters, Symmachus, states that Constantius asked about the origins of Rome’s temples and confessed his admiration for those who had built them. Constantius soon left Rome, moving north to begin military operations against the tribes along the Danube. His trip to Rome in 357 was the only one he would ever make. He died of a fever in November, 361 on his way to confront his cousin, Julian, who had recently declared himself emperor. Beautiful! Beautiful post! Thank you for this piece of history!